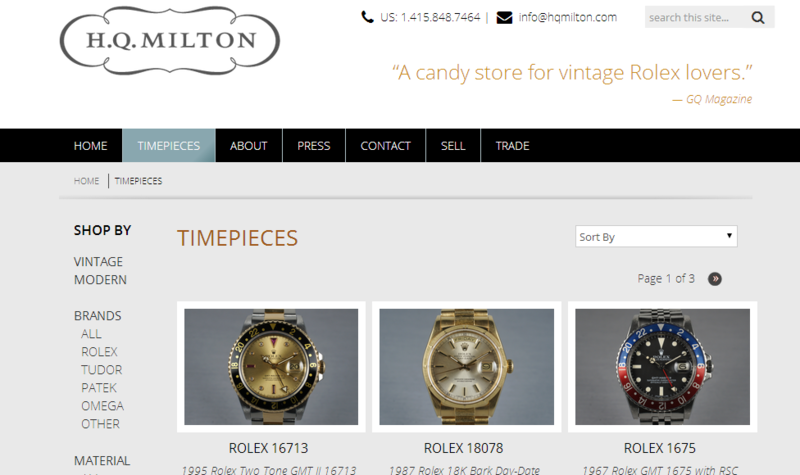 SEO Results: New website and content strategy for world-renowned vintage Rolex dealer in San Francisco. 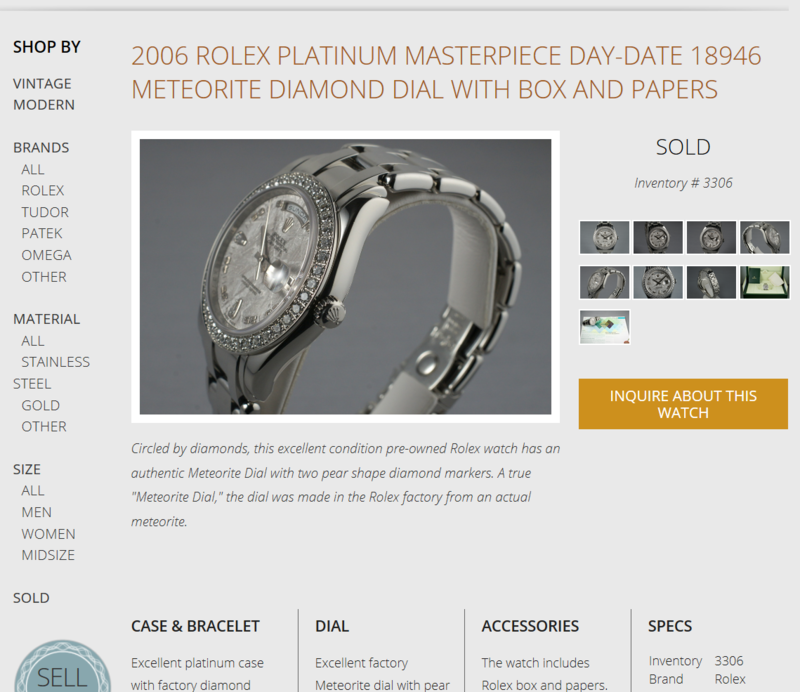 When one of the world’s largest buyers and sellers of vintage Rolex watches came to me, they knew their 4-year-old website needed updating. Their lack of presence in the major search engines – Google, Yahoo and Bing – didn’t represent their industry position. Other than a logo, they had no marketing. The owners were experts in vintage Rolex, great at customer service, but they had almost no skills in marketing and even less understanding of search engine optimization. Revamping or building a new website is nearly always the best time for integrating SEO into the brand development, and this case was no exception. In this case, their lack of marketing content and expertise was an opportunity to create a strong content strategy and incorporate Google’s SEO best practices. The website was optimized on a technical and creative level that was in line with the owners’ strong sense of brand identity. Within 2 months of launching their new site on December 17, 2013, analytics showed exponential increases in organic search traffic. By January 27, 2014, highly desirable keywords such as “vintage Rolex” and “vintage Rolex watches” had seen increases in click-throughs of +972% and +475%, respectively. The number of pages indexed more than tripled from fewer than 1,500 pages to more than 4,500 within just days of launching the new site. Although having your page crawled and indexed does not guarantee ranking by any stretch, it is the first step. Before Google can rank you, they have to index you. 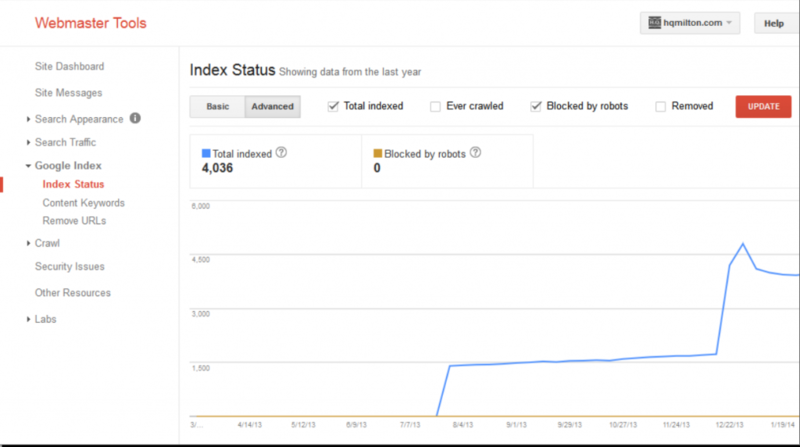 Number of pages indexed by Google search engine soared after implementing SEO best practices. Before you can get to where you’re going, you need to know where you’re at. It’s like trying to drive somewhere without a starting place on the map. How do you know whether to make a left or right? The Online Visibility & Marketing Audit provides the critical starting point. In this case, we identified the existing competitive landscape for vintage Rolex watches and H.Q. Milton’s place in the online landscape, including: the quality and quantity of their placements in: Google SERPs, image and product searches, social media networks, blogs, traditional magazine and periodicals, and local searches. This investigation phase and the client’s stated goals revealed what we needed to know in order to formulate the content strategy. Once we know where you are in the online landscape, we can determine the turn-by-turn driving directions needed to take you where you need to go. The content strategy is the route to take when faced with more than one possible way to go, and there are near-limitless options in online marketing. Looking at the content, their old website had no logical hierarchy or keyword focus. By thematically grouping and matching the prime keywords to the newly outlined content, a series of landing pages or entrances was created that would be most relevant to viewer’s search term. Having identified what was missing in the audit as well as the areas most likely to yield the most growth, a new website was outlined that matched their importance and included meta content, structured data, social media integration, and XML sitemaps. After the audit and the strategy phase, the actual writing and creation of content takes place. For some clients with the ability and available manpower, they choose to write and manage their own content after the strategy is completed. Now more than ever, writing that ranks needs to be grammatically sound, sophisticated, descriptive, and varied. The Panda algorithm update is particularly associated with punishing low-quality content replete with spelling and grammar errors. Rich content from which contextual meaning can be drawn appeals to readers and Google’s increasing adoption of the principles of the Semantic Web and Knowledge Graph integration. In this case, entirely new content was written for the client after a series of interviews and discussions. Page-by-page keyword focus groups were determined, which guided on-page writing and meta content. All existing pages were redirected and descriptive new URLs were written for each page. One of the main deficiencies of the old site was a lack of description about their service of buying vintage watches from clients, not just selling. More real estate was given to educating clients about selling their watches to H.Q. Milton with an entire page in the main menu and sell buttons on every product page. 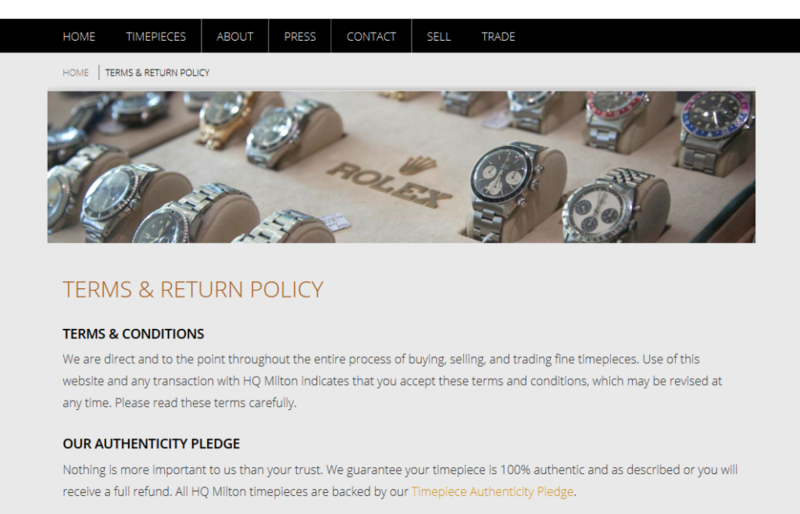 Trust is always an issue when it comes to authenticating a luxury item. Despite their worldwide acclaim and iron-clad guarantee, there was very little on the website to support their stellar credentials. A new press page was added, plus an authenticity pledge was designated to appear on every product page and in more detail as its own page. SEO is competitive. What was enough to get you to the first page of Google may not be enough to keep you there indefinitely. Keeping applied pressure on your organic traffic is the best way to ensure lasting results. In this case, the ongoing optimization of content across the website improves individual page optimization and targets valuable keywords, plus helps to increase the overall importance of the website in the eyes of Google with quality meta content. The planned addition of a blog, additional structured data, expanded press coverage and online media center also help to ensure Google will continue to view the website as a source for fresh, finely crafted content when someone searches for vintage Rolex. Want results like these for your business? Contact us now for a complimentary consultation to see if you’re a good candidate for our targeted SEO services in San Francisco. See more results> SEO Case Study: Precise content strategy for one of San Francisco’s most prestigious law firms vaults coveted keywords to first page of Google.